Rage has been in the pipe for six years. "We invented this genre and we followed it a long ways...Maybe we shouldn't have been quite as ambitious." On Rage: "It really is probably the most enjoyable id game, from my perspective, we've ever made." "I've never been one who played deathmatch for 8 hours." "Everything we envisioned pretty much made it into the game." "I don't have that resolution of imagination that the artists do." "The bottom line is still [on Xbox] it can take 150 milliseconds [to load a single texture]; worst case it may take 15 seconds for every one [in a single level]." Artists at id, after hearing Carmack's explanation of the varying scenarios that might affect the number of polygons they might be able to use: "We want a number." "Go make really cool stuff and I'll figure it out. "-Carmack's response to the artists. "It pains me a lot that Microsoft and Sony don't allow us to plug into a keyboard." Blu-ray has worse latency than DVD: "It'll be nice when we don't have that physical element we don't have to be working around or scheduling around." Installing Rage on Xbox 360's hard drive will take 21-22GB of disc space. Despite the PCs being "up to 10 times faster" than the consoles, it's often been difficult to get 60FPS running on PCs because of all the different layers between the games and the hardware. There are hacks in all current graphic cards to check if you're playing early Quake-engine games. "There are archeological reasons why PC drivers have the stuff that they do." There are the far-out ideas for future engines like "tracing and splatting an voxels; non-polygonal stuff, but that's not what we're working on now." "We're just using the PC as a muscular console at this point." "I spend a lot of time smiling and being amazed at how much power we have in [modern PCs]." Carmack wishes he had time make a test app for an Atari 2600. On future special effects that might be created using fast Fourier transforms on the entire images: "An almost criminal way to spend all those floating point processes." "We have arguments about the usefulness of post-processing. To have the post-processing go in an muck up all the pixels is depressing in some ways." "You'll try to tell a programmer their operator is error-prone. And they'll say, ‘Only if you're a bad programmer.'" "Any 360 programmers who are listening to this: If you are not using ‘Analyze', you are making a mistake." 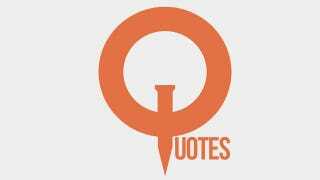 "There Are lines from Quake in modern games-not doing anything important, but they're there." "I'm not a grumpy old man about kids not programming Assembly." On the idea of another programming challenge: going back to older hardware like the PlayStation 1 and "writing a mail client": "This would be like the Society of Creative Anachronism of programmers."